These two pictures were found recently whilst clearing a deceased relative’s house. They were still in a package sent from Canada by my grandmother’s eldest sister and addressed to my grandmother, the address and stamp indicating that it was posted around 1963. The customs declaration states ‘Photographs.’ The pictures each measure approximately 12 x 10ins and are on quite thick card - not obvious photographic paper – and they appear to have spent time in an oval frame. 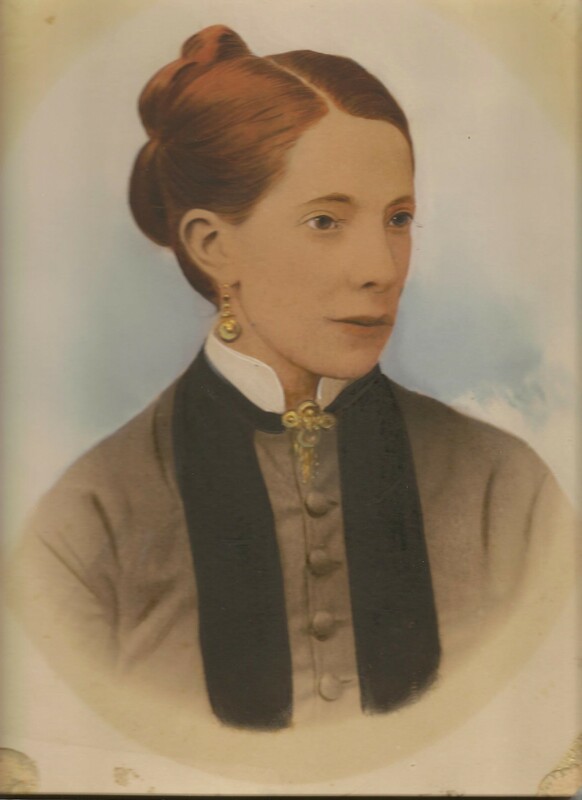 My grandmother and her sister were named Manning before marriage, but I do not believe the images represent their parents, who married in 1873. Instead, could they possibly be the sisters’ grandparents, who were married in 1834? Could it be that the package was originally sent from England to Canada? And is it possible that these are paintings not photographs? These are interesting pictures which provide a great deal of helpful information: in fact, the answers to most of your questions are here, right in front of us, but because these images don’t look like ‘ordinary’ portraits and are different to the kinds of images we are familiar with today, they prompt many queries and may seem rather baffling. Understanding what they are, how and why they were created, and what the information on the back means ensures their correct interpretation and should prove useful to you - and also to any readers who have similar pictures among their family heirlooms. Essentially these paired pictures are enlarged and re-touched photographs. Note that they were recorded correctly on the customs declaration as ‘photographs’, so when they were posted to Britain from Canada in around 1963, your grandmother’s sister knew exactly what they were. Regular Victorian photographs were rather small – often neat carte de visite prints measuring only 10 x 6.5cms; however any decent photographic studio could produce photographic copies and enlargements and sometimes clients ordered enlargements of photographs of themselves (or of close relatives’ photographs), in order to create more substantial pictures suitable for framing and hanging on the wall, or displaying on a table. As you point out, clearly these two pictures have indeed been framed at some point. Perhaps the frames were removed for their despatch to England in the 1960s, or later, for easier storage. When enlargements of photographs were created they were often presented on sturdy card mounts, just as you have described with regard to these portraits. During the enlarging process much of the finer detail of the original photographs was lost, and in order to restore image quality and also to make such pictures appear more lifelike and impressive, it was usual for them to be retouched by hand – generally using coloured paints. Commonly the painting was extensive and it could be rather ornate, as seen here, where jewellery has been painted gold and given a special treatment similar to embossing. Sometimes in surviving examples the images can look so heavily painted that they almost appear to be original paintings and not photographs at all, although it is usually possible to discern something of their photographic origins. Certainly here, although the painting covers every part of these pictures, it is finely executed and does not completely obscure their original photographic quality. 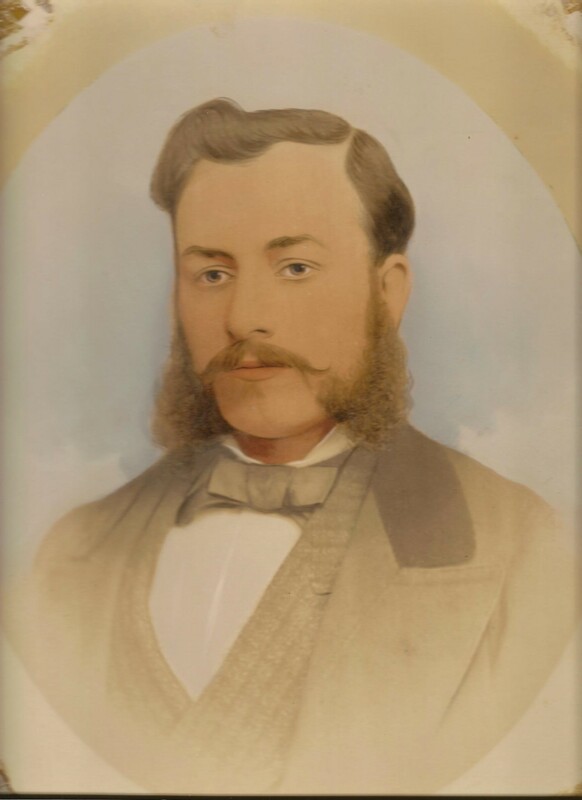 Sometimes the painting of photographs was done in-house by a member of the photographic studio staff, but often it was sent out to a local professional artist, with instructions on the back, stating what colours to paint the subject’s hair, eyes, complexion and their clothes. This is precisely what you have on the backs of these pictures – a standard printed label completed by hand with colour instructions for the artist who was going to re-touch them. (While on this subject, could ‘pilgreen’ mean ‘pale green’, perhaps?) You also have numbers here, which may refer to the negative numbers of the photographs. Fortunately the name ‘Mrs Manning’ is also clear and strongly suggests that she was the client who ordered the enlarged pictures. From the information that you have provided, I would think that she is likely to be the mother of your grandmother and her sister, whose birth name was Manning. Mrs Manning could also, of course, be the subject of one of these portraits, so let’s see if her identity fits by estimating the date of the original photographs on which these enlargements were based. We can only see a head and shoulders view of the two subjects, but female fashions usually offer a firm date range for photographs and paintings. The lady’s elaborate hairstyle and distinctive front-buttoning bodice with contrasting panels is dateable to the mid-late 1870s – c.1875-80. The male portrait also dates from the same time period, key fashion-dating features his swept-back hairstyle, bushy ‘mutton-chop’ whiskers and coat with wide lapels. As you remark, there is a pencilled date, 1875, on the back of one of the pictures and because the fashions could fit this year, it seems safe to assume that the photographs (and perhaps also these enlargements) were created in 1875. Undoubtedly these pictures are a pair and represent a man and wife. The subjects appear to be fairly young, aged perhaps in their late twenties or thirties. All the evidence suggests that they are your grandmother’s parents, who married in 1873. They cannot possibly represent your 2 x great grandparents, for they were married much earlier, in 1834. It is likely that these pictures accord with a special occasion and perhaps this was the Mannings’ 2nd wedding anniversary in 1875. Some Victorian couples celebrated many anniversaries, posing for a photograph to mark the event. There doesn’t seem to be a studio or artist address on these pictures, so unfortunately we don’t know whereabouts the original photographs or these enlargements were created. However, if your great grandparents were always resident in the UK it is likely that they were ordered from a local studio, close to where they lived. If correct, this means that the portraits must have initially been sent from England to Canada, as you suggest, but for some reason were posted back to your grandmother c.1963. Either way, you are lucky to have inherited attractive, coloured photographic portraits of your ancestors – special heirlooms to preserve and pass on to the next generation.